Buy Ruvati Combo Sinks and Faucets at FaucetLine.com. Free Shipping!!! Beautiful. Inspired. Unmatched. The beauty and quality of Italian style. Ruvati USA is a manufacturer of premium stainless steel kitchen sinks and faucets. Ruvati sinks are constructed of heavy duty 16 gauge stainless steel. Ruvati faucets feature ceramic disc valves and exquisite brushed nickel or polished chrome finish. Quality you can trust, and functionality you will love... that's the Ruvati guarantee. Ruvati offers three simple things: beautiful products that accentuate any home, inspired design that is attentive to every detail while enhancing usability and unmatched quality that lasts a lifetime. Ruvati sinks and faucets are influenced by Italian design, giving any home a classic look and timeless luxury. But form is little without function; so all Ruvati sinks and faucets are built with you in mind. They are designed to be functional and useable enough for daily use, as well as being a joy to both the eye and the hand. All of Ruvati products are handcrafted, individually inspected and held to the highest quality standards in the industry. Ruvati kitchen sinks are handmade from premium grade stainless steel and feature sound guard coating to reduce noise. All of Ruvati faucets are constructed from solid brass and feature ceramic Sedal disc cartridges, ensuring a lifetime of drip-free use. 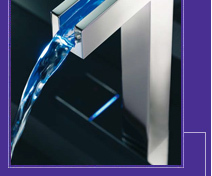 Ruvati sink and faucet combos are designed with you in mind. Ruvati has packaged one of our premium 16 gauge stainless steel sinks with one of Ruvati luxury faucets to give you the perfect combination of form and function. Combo set includes Stainless Steel Sink, Faucet, Sink Bottom Grid(s), Basket Strainer(s) and Cutout Template. Sinks constructed of 16 gauge premium 304 grade stainless steel (18/10 Chromium/Nickel content). Combo sink features luxurious brushed satin finish - easy to clean and long-lasting. Heavy duty sound guard padding and undercoating on sink minimizes noise.